It can lay low a dragon or heal a wounded warrior. It is the most sought-after magical power in all Faern. And it is in the reluctant hands of Shandril of Highmoon, a young, orphaned kitchen-lass. Now she's on the run from half of the evil sorcerers in the land, not to mention their relentless minions. But with the help of a handsome young wizard, some rough-and-tumble Knights of Myth Drannor, and a certain old mage of Shadowdale, she just might manage to stay alive. An all-new expanded version of Ed Greenwood's classic tale, including a new forward by the author. 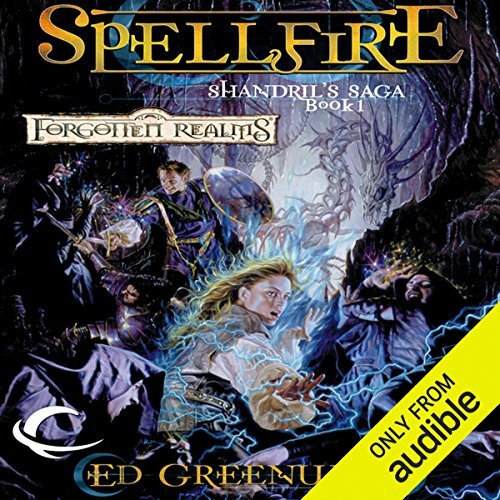 One of Ed Greenwood's most popular novels, Spellfire is being rereleased in an all-new audio edition. This version has been completely reedited and contains added material that bring new excitement to the story. This edition is classified as the first title in the brand-new Forgotten Realms series Shandril's Saga. ©1988 TSR, Inc., c. 2005 Wizards off the Coast LLC. 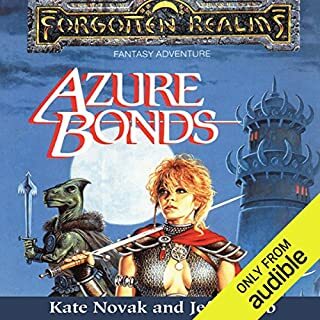 (P)2013 Audible, Inc.
Would you try another book from Ed Greenwood and/or James Patrick Cronin? 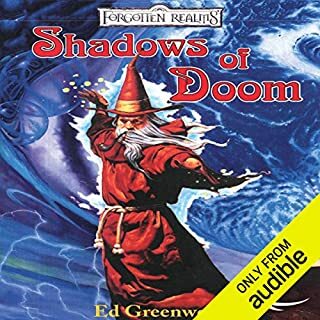 Oddly, I enjoy reading/listen to Ed Greenwood's work. I usually find it mildly funny and charming in a high fantasy/young adult line of books. This one however, was just horrible from the start and stayed down the entire time. James Patrick Cronin was abysmal. 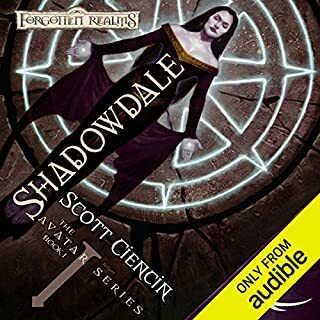 I have listened to JPC in other Realm's series (Brotherhood of the Griffon) and he wasn't bad. But, for some reason he destroys a few of the main characters here with a sloppy English accent. You'll never want to hear the word "Lady" (he pronounces it lay-day) again. Has Spellfire turned you off from other books in this genre? I'm over 50 books deep on FR on audible. I'll keep going but not with James Patrick Cronin. Honestly, anyone would have been better. He mispronounces some of the names (people and places) and some of the characters sound horrible with his choice of voice. Of course, a narrator like Victor Bevine would have been much better. If you could play editor, what scene or scenes would you have cut from Spellfire? At 17 hours long... the first 4 hours are a confusing mess. Ed is known for this but it's long winded just to be long winded. I found myself starting and stopping the first 8 hours countless times just so I could stop hearing James Patrick Cronin and Ed's trivial scenes. I have enjoyed both the narrator and author before but this book was very tough to get through. Perhaps reading this novel would have been a better choice. Listen to the preview (I don't know if JPC choice for Norm and Chandrill are in there... but they're bad). Takes a minute to get going, but worth it. I'm going to get the worst parts out of the way. The narrator is nothing special. Often times he drones on in a complete monotone drudge, and my personal pet peeve with some narrators, he adds no emphasis, emotion, or intonation to the characters he's reading, so often times I have to mentally go back after a vocal scene, and replay it in my head with the correct emotional portrayal between the characters. The story however is fantastic. it starts slow, but picks up at a quickening pace. By the end of the book, I was able to forgive bad narration in favor of how the actual story played out. As for the story let's not play dumb, this is a Dungeons and Dragons book. 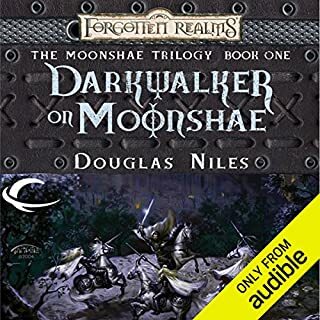 Specifically set in The Forgotten Realms. There is going to be silliness and some slapstick banter between The cast. In that regard it mimics well the banter you may see at a gaming table. But take the book and story for what it is, and you can enjoy it well. Good for lore, but bad writing. 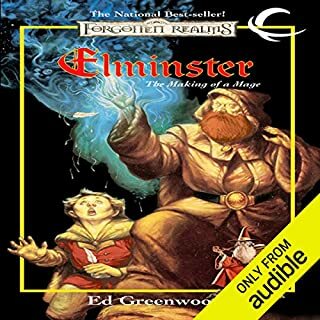 Ed Greenwood is good at filling Faerun with lore but is a bad novelist. For some reason I can't get attached to anu of the characters. I do think he jumps perspective too often between people in the same scene. So you only get a topical feel for many characters rather than an indepth understanding of a few. great story. I love the reappearance of elminster, and the beginning of his new romance/ relationship with the symbol. I hope that story is explained later on. there is a lot of tragedy throughout the book, but some good character arc expansion & world building that occupies much of the story arc. although, I must say the spellfire is SUPER O.P.!!! It would not only unbalance a written world, but any game world as well. still, it was a fun listen. the narrating could have been better, especially considering this was to be a special edition release. a female narrator for female characters would have made all the difference. the guy did the best he could, but with so many characters, there was no way for him to make each voice distinctive. I stopped after a couple of chapters. This is a childhood favorite which I attempted to revisit. Regrettably the voice acting is so annoying I could not even listen. Greenwood should stick to RPG design. His books are child like and the story's are bland and poorly thought out. Characters ramble on and on to get even the most simple ideas across. And the narrator was poor making good this even more of a trial to finish. Forgotten Realms classic fantasy well performed (read). A great book by Ed Greenwood - i enjoyed this fantastic setting. The different voices were excellent and made the story memorable. Elminister's voice seemed spot on for what I would envision. 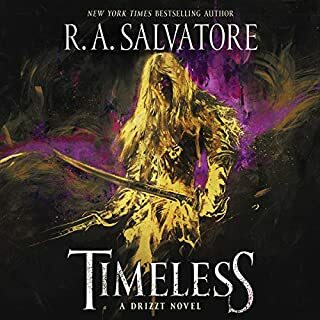 I have this saga in paperback that I read years ago and looked forward to listening to it, like I'm doing with all my Elminster and Drizzt books. But this narrator has one of those voices that grates on my ears like nails on a chalkboard. can't even get past chapter 2. This one made me start sampling the books first to listen to the voice so I don't waste another credit. Struggled to finish! It was hard to follow. Very silly! It had great potential but fell short.